Behind the scenes of Changi Airport’s high-flying success is the Civil Aviation Authority of Singapore’s (CAAS) team of professionals committed to the excellence of Singapore’s aviation hub. CAAS has been enabling the growth of the air hub and aviation industry in many ways – by making safety a priority, providing air navigation services and developing Singapore as a Centre of Excellence for aviation knowledge and talent development. 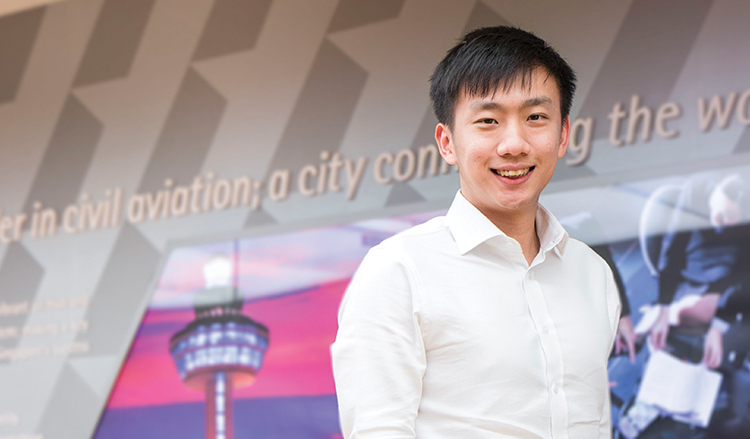 Working for the CAAS’ Air Transport Division is CAAS Undergraduate Scholar Chen Yiliang. He tells us how his passion for aviation led him to his role as Deputy Manager of Air Transport today. The Scholarship opened the doors to endless opportunities for Yiliang to grow within the industry. For instance, he got to experience three internships at CAAS which deepened his understanding of the organisation. These allowed him to understand how he will be able to best fit and complement the organisation when he officially commenced work. This is why Yiliang is grateful for the slew of CAAS initiatives that support freshly-minted officers as they transit into the workforce. These include the orientation programme, buddy system and mentorship programme. Today, Yiliang works in the Air Hub Economics section of the Air Transport Division. As Deputy Manager, he engages in bilateral and multilateral air services relations and negotiations with the countries under his portfolio. He also analyses data to uncover insights and develop solutions to support the implementation of policies. These are all done in order to further Singapore’s air hub competitiveness. Tan Run Yan tell us about his experiences with SP Group and the developmental opportunities he has been afforded as a scholar.